Revenue from home theater categories specifically though, is down. The folks at the Consumer Electronics Association are happy to report that custom installers had a strong 2010. In all, installers ended up with 13 percent more revenue than they did the year before - not a bad setup. What's interesting though is that less of that revenue came from home theater installs. Significantly less. Revenues fell seven percent in that category with lighting and security picking up the slack. 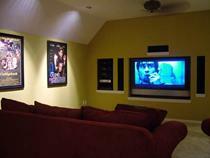 The CEA posits that the wide range of new install projects is the reason for the decreased revenue in home theater categories. Of course, with 3D content finally making its way to the market, that's expected to change. Around three quarters of installers expect to be focusing on 3D offerings in the next two years.